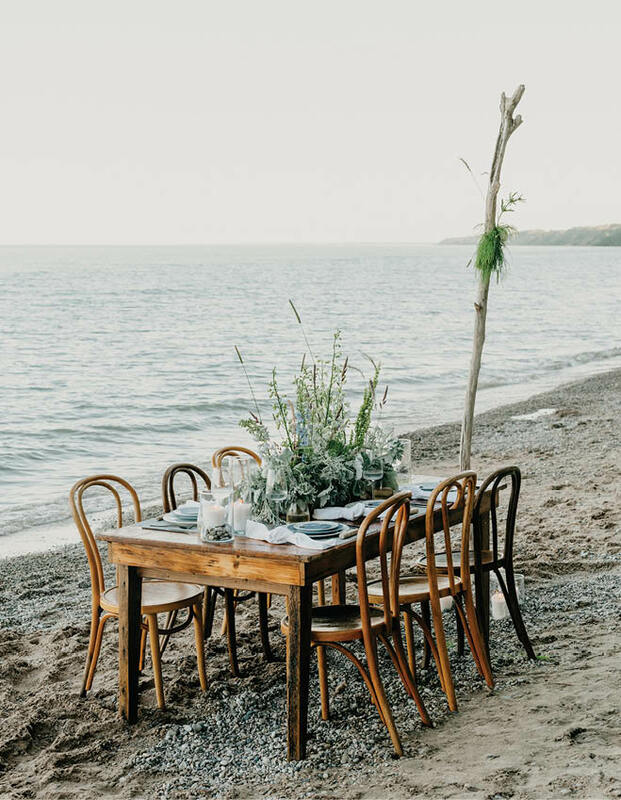 Want a rehearsal dinner venue your guests will never forget? Make it truly great on the pristine shoreline of our own Great Lake. Think quiet elegance in soft blue-grays, white and sand, inspired by the colors of the coast. 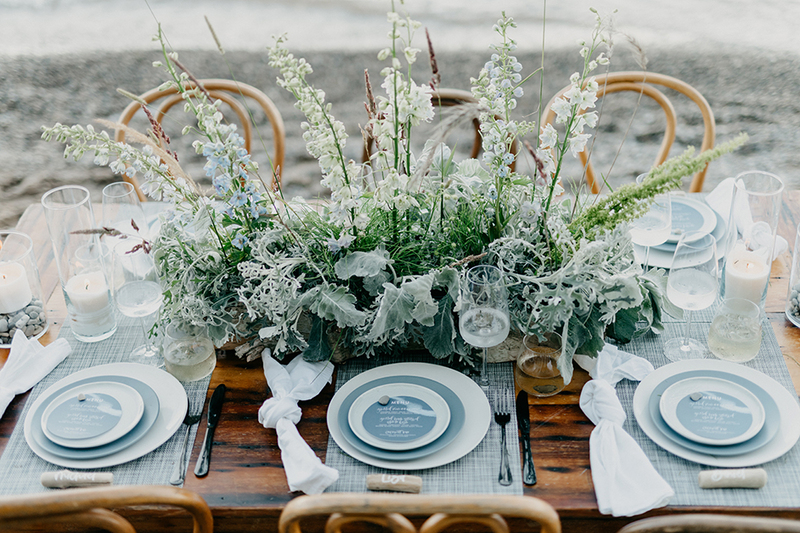 A barnwood farm table and wooden chairs at water’s edge make for a private dining experience par excellence. 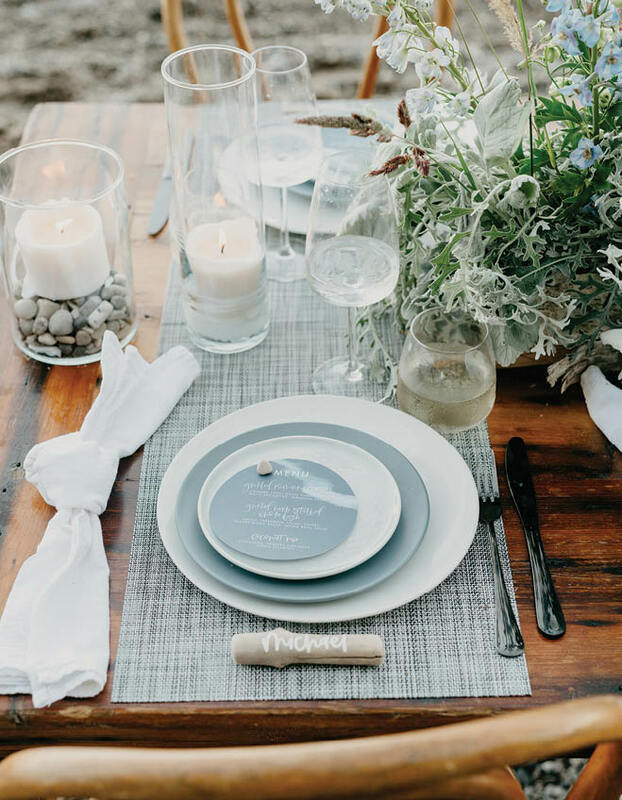 In this setting, styled by MKSocial, driftwood gathered on-site doubles as rustic place cards, and crisp linen placemats and clean lines of tableware reflect the simplicity of the surroundings. Even the rippling calligraphy by Adeline Margaret Lettering + Design on the menu calls forth the wavelets curling into the shore. 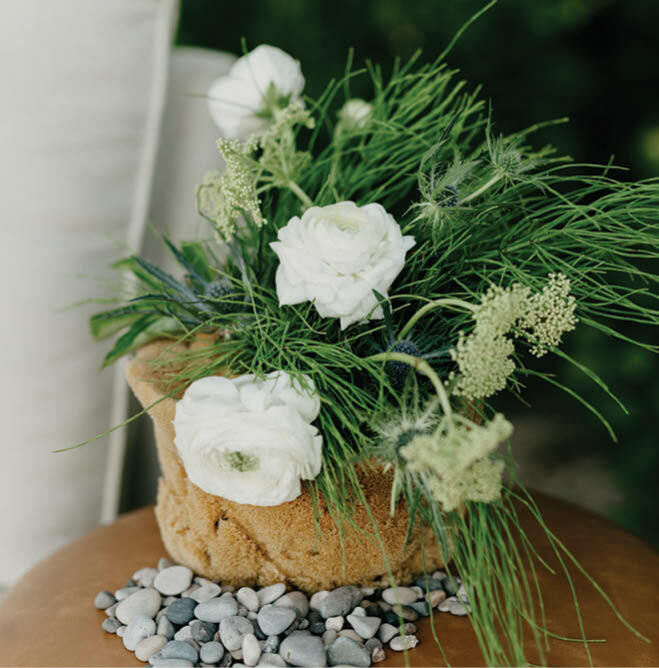 A tiny breakwater of pebbles shores up the casual arrangements of white ranunculus, sea holly, and wild grasses, created by Floral Alchemy. 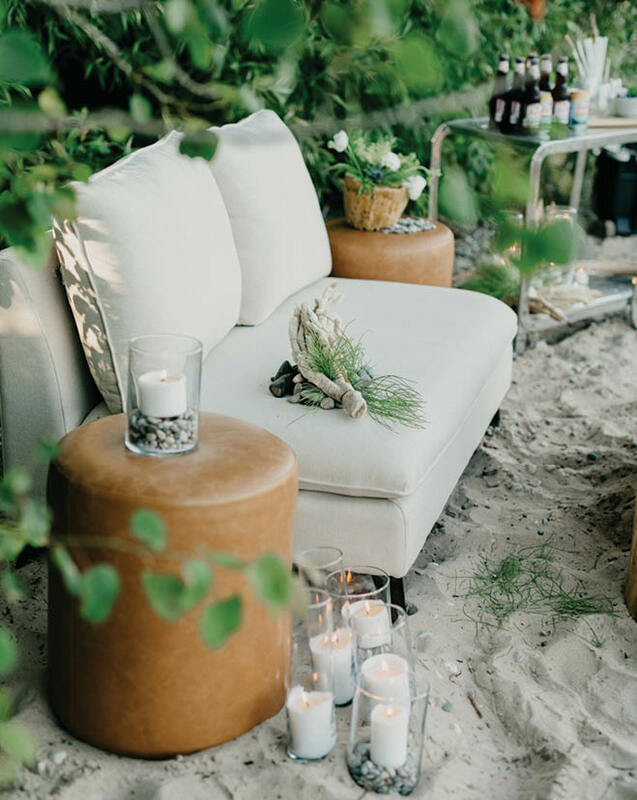 Guests can enjoy the view in casual comfort on a cozy loveseat from A La Crate Rentals, with bouquets of driftwood and greenery for a grace note. How about a libation plucked from this charming bar cart? 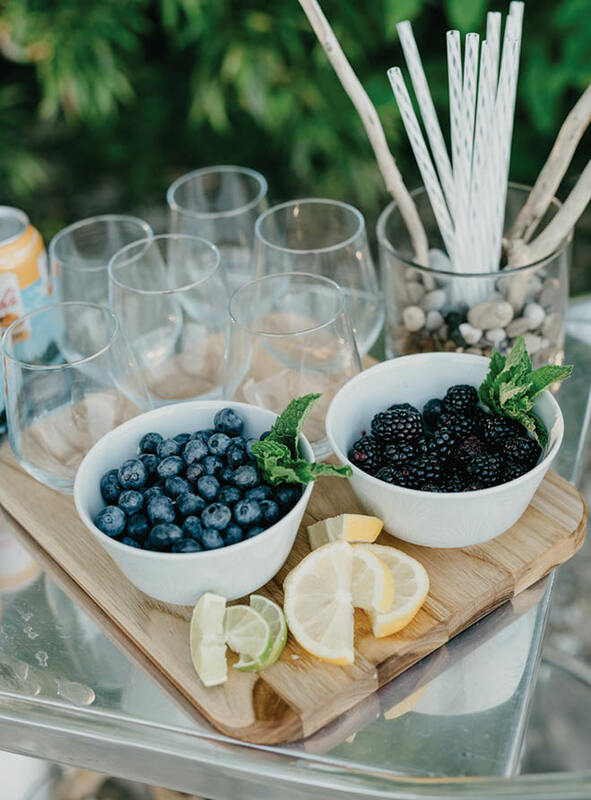 The nearly not-there glass-and-steel frame keeps the scenery front and center, while blueberries and blackberries tempt guests with a tasty garnish for their beverage. 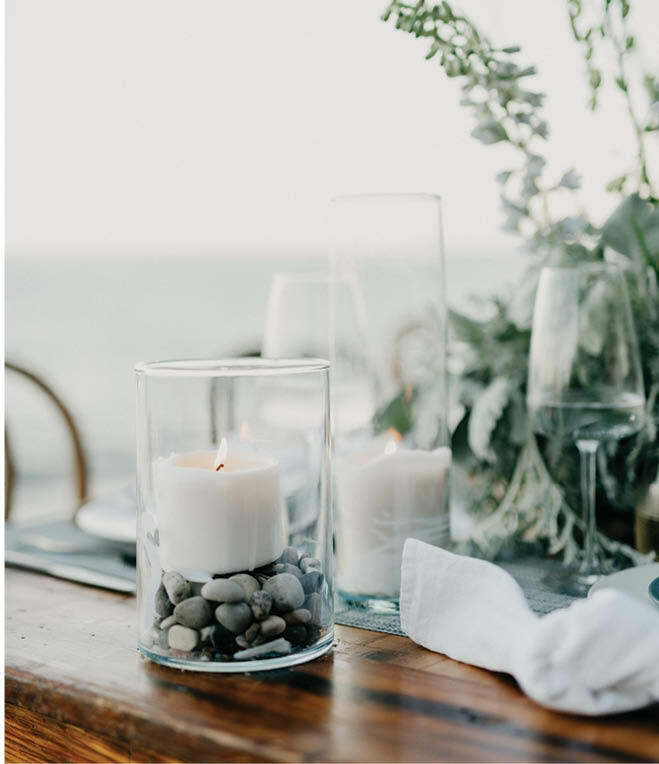 As twilight steals across the horizon, guests can settle in and share stories by candlelight, with hurricane lamps anchored by Lake Michigan pebbles. An imaginative centerpiece by Floral Alchemy combines delphinium, dusty miller, sea holly, ranunculus and native Wisconsin grasses, with a hint of sweet summer meadows breezing down to the sand.